The Intersections & Beyond: Move.ph calls for submission: "Stories That Move Your World Contest"
Move.ph calls for submission: "Stories That Move Your World Contest"
Move.PH is on a quest for compelling stories — about leaders, movers, ordinary folks who make a difference or impact the lives of other people. Stories build community and create bonds that organize our past and shape our future. What affects you affects others. We believe our country moves forward faster if we share and build our dreams together. We ask for stories in various forms — either essays, photo essays, video, or multimedia — a compelling view into your world today. Tell us about classmates, parents, teachers, policemen, kasambahays, ordinary folk with colorful and inspirational stories. Or recreate events that changed your life and shaped you. Or weave your dream of our future. Tell us YOUr Story. Make your world MOVE our world. 1. Amateurs and students between the ages of 18-40 are welcome to join. 2. Freelancers with no more than six months experience. Note: Excluded are professional journalists or anyone affiliated with any news organization or news production house. There are four categories for this contest: essays, photo essays, videos, and multimedia. 1. Essays, photo essays, and videos should be about people with compelling stories. They can be in English or Filipino. 2. Essays either in English or Filipino should have a maximum of 800 words, with a space between paragraphs. These should be emailed to discuss@move.ph. 3. Photo essays should have a maximum of 12 photos with corresponding captions. A brief essay of not more than 300 words should accompany the photos. 4. Videos should have a maximum length of 2 minutes. They can be produced with the use of either mobile phones or digital cameras and uploaded on YouTube with the appropriate link emailed to discuss@move.ph. A brief description of the video entry should be included. 5. Multimedia entries can be any combination of the formats listed above. Essays accompanied by graphics or photos, for example, will qualify in the multimedia category. 6. Only original work prepared for the contest will be accepted. 7. An entrant can submit as many entries s/he desires, in whatever format preferred. 8. Deadline for the submission of entries will be 12 midnight of Nov. 5, 2011. Three winners will be announced on Nov. 30, 2011. 1. To join the contest, interested participants should have a Facebook account and “like” the Move.PH page (facebook.com/Move.PH). 3. A form should be filled up per entry. 4. Submissions or links to submissions should be sent to discuss@move.ph. Submissions will be acknowledged to confirm receipt. 5. Queries can be directed to 0947-784-7061. A board of judges consisting of professionals and journalists chosen by Move.PH will choose three winners who will each win a multimedia reporting kit. 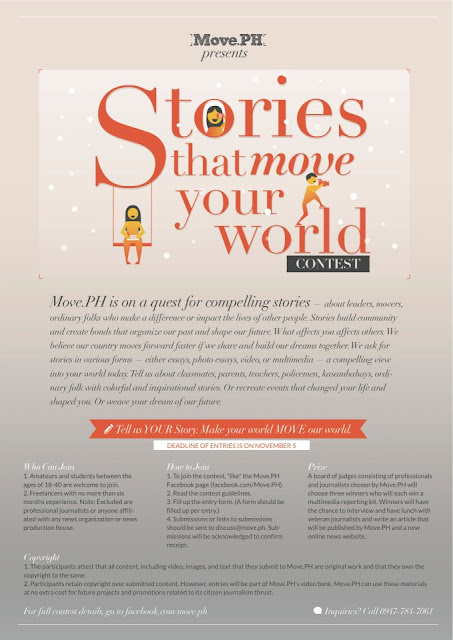 Winners will have the chance to interview and have lunch with veteran journalists and write an article that will be published by Move.PH and a new online news website. 1. The participants attest that all content, including video, images, and text that they submit to Move.PH are original work and that they own the copyright to the same. 2. Participants retain copyright over submitted content. However, entries will be part of Move.PH’s video bank. Move.PH can use these materials at no extra cost for future projects and promotions related to its citizen journalism thrust. This contest is in no way sponsored, endorsed or administered by, or associated with, Facebook. The recipient of information inputted through the entry form provided here is Move.PH, not Facebook.